Beatles Related - John Lennon and Jimmy Carter Autographs. This unique item is a 5.25" x 3.25" autograph album page signed by both the late Beatle and the former president in black ballpoint. The signatures were obtained at the January 19, 1977 inauguration concert held the night before Carter was sworn in as the 39th President of the United States. The page is in Very Fine condition with some mild tearing along the left edge from being removed from its book, and some mild tanning to the top and right edges. The signatures are bold and clear. A great item. 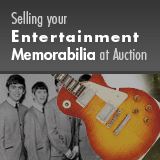 Accompanied by an LOA from noted Beatles historian Frank Caiazzo and a James Spence Authentication auction LOA.